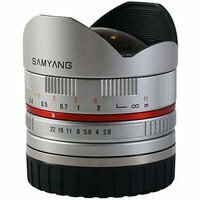 Lightweight and compact, this wide-angle 8mm fisheye lens from Samyang is ideal for landscapes, architectural work, night scenes and creative experimentation. UMC stands for Ultra Multi Coated, which indicates that the lens has been covered with multi-layered, anti-reflective coating which is designed to minimise reflections, increase light transmission and image contrast. The maximum angle of view will amount to 180 degree, with a minimum focusing distance of 0.3 meters. The lens is for use with Fujifilm's X series of compact system cameras. Manual focus operation only.